THE FATHER OF one of the two men accused of the murder of Michaela McAreavey in Mauritius has told the trial that he did not lie in order to protect his son. Defence lawyer Sanjeev Teeluckdharry, who is representing accused Avinash Treebhoowon closed his case today after examining his last three witnesses, including father of the accused Sooriadev Treebhoowon. Responding to questions from the lawyer, the 52-year- old labourer denied that his son had told him, “Forgive me. I have made a mistake” when he went to see him at the premises of the Major Crimes Investigation Team (MCIT) on the day of his arrest on 12 January 2011. Sooriadev Treebhoowon claims that his son had told him “Forgive me, I have done a mistake; I’ve left your house”. He added that his son asked him to take the necessary steps for his release after he complained of police brutality. He told the court that his son had told him: “Please take me out of here, police is beating me heavily”. During the cross-examination, leading counsel for prosecution had difficulty in getting answers from Sooriadev Treebhoowon who speaks Bhojpuri, a Hindi dialect which is the mother tongue of remote villagers of Indian descent in Mauritius. 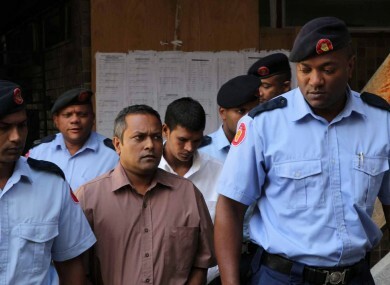 Separately, the defence counsel for the second man accused of the murder told the court that “we have murdered our own justice, our own island” by the way the Mauritian police have behaved. The lawyer pointed out a number of what he described as “inconsistencies” in police actions during the murder inquiry. Rama Valayden was opening the case for his client Sandeep Moonea, a former room supervisor at the Legends hotel in Mauritius, where the McAreavey couple were spending part of their honeymoon. Valayden emphasised the importance of the jury in the trial and asked jurors to beware of the risk of misinterpretation. He told the court that the prosecution has failed to quench all doubts underlying in the case and relied too much on the burden of proof. The lawyer said that his client doesn’t want to walk out of the court at the end of the trial “on a technical point of law” but instead “as a man whose innocence has been demonstrated”. Earlier in court today Teeluckdharry called for a stay of criminal proceedings against his client due to disputed remarks made during the cross-examination. The judge briefly adjourned the court for an hour to discuss the issue before rejecting the motion. The judge did say that remarks and interventions he had made during the disputed cross-examination will be expunged from court records. The jury was informed of the decision. Avinash Treebhoowon, a former valet at Legends Hotel, is accused with his superior, Sandip Moneea of the murder of Michaela McAreavey. The 27-year-old was found dead in her hotel room on 11 January 2011. An autopsy revealed that she had been strangled. Both of the accused men plead not guilty to murder. The trial will continue tomorrow when the second defendant will be called to give evidence. Email “Michaela murder trial: Witness denies lying to protect his son”. Feedback on “Michaela murder trial: Witness denies lying to protect his son”.